The Skinny: A wonderful family film that waxes nostalgic for a simpler time during 1950s Japan. While the manic melodramatic performances may turn some off, the teary sentimentality of the overall film will touch hearts and make one care for these characters. JMaruyama: Who would have thought that director Yamazaki Takashi, the man behind such big sci-fi action films as Returner and Juvenile was capable of directing such a sweet and heart-touching movie about the importance of family, nostalgia and community. 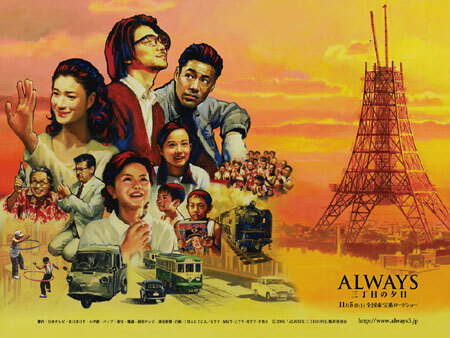 Set amidst the backdrop of the construction of the Tokyo Tower (1957-1958), Always San Chome No Yuhi (Always - Sunset On Third Street) follows a young high school student from the northern prefecture of Aomori, Hoshino Mutsuko (Horikita Maki). A recent Junior High graduate who is now off to Tokyo, Mutsuko has been accepted for employment at a "prestigious" Auto Company. However much to her chagrin and disappointment, Mutsuko discovers that the cozy job of her dreams is merely an apprentice mechanic's position with a small, struggling auto repair store. Its owner, the proud and hot-tempered Suzuki Norifumi (Tsutsumi Shinichi), is a former soldier and himself a country boy who came to Tokyo with dreams of setting up his own car factory. Norifumi is equally disappointed that his request for a first rate mechanic went wrong (Suzuki misread Mutsuko's resume, which stated that she had taken courses in bicycle "jitensha" repair and not car "jidousha" repair). Conflicts arise as Mutsuko struggles to learn the car repair business from Suzuki. Her only allies at home are Suzuki's kindly wife Tomoe (Yakushimaru Hiroko) and Suzuki's rascally young son Ippei (Koshimizu Kazuki). Across the way, struggling writer and neighbor Chagawa Ryunosuke is also having a battle with harsh reality. Despite graduating from acclaimed Tokyo University (Todai) with a literature degree, he still can't get decent work as a writer. To make ends meet he frequently submits sci-fi and adventure stories to a weekly "Shonen" (young boys) magazine even though he considers it trivial and unfulfilling work. He just barely makes ends meet through sales of kids toys and candy at his grandmother's store, which he inherited. His world suddenly changes when the local bar madam, Ishizaki Hiromi (Koyuki) a former dancer, asks him to take care of an associate's little boy, Junnosuke (Suga Kenta). Unable to say no to the beautiful madam, Ryunosuke takes in the shy and distant boy. As fate would have it Junnosuke turns out to be a big fan of Ryunosuke's "Shonen Magazine" work and a father-son bond slowly begins to form between the two. Even Hiromi soon begins to fall for the nebbish writer, after seeing how well he looks after Junnosuke. The screenplay by Yamazaki and Kosawa Ryota was adapted from Saigan Ryohei's Shogakukan/Big Comic Original manga (comic) series "Yuyake No Uta-San Chome No Yuhi" which told various nostalgic stories about different kids, teens and characters living in Tokyo of the 1950s and how they adapted to Japan's ever changing cultural, technological and social climate. While the movie does take much of it's inspiration from the manga, it also seems very much influenced by Robert Zemeckis's Forrest Gump, particularly in the way it plays with real historical events and characters in its story. Always does something similar by somewhat eschewing some factual accounts. The character of Suzuki Norifumi is most certainly based on real life founder of "Suzuki Motors" Suzuki Michio, although his rise to fame is different. Ryunosuke Chagawa is most likely based on 1920's author Ryunosuke Akutagawa, the father of Japanese short stories and whose work Kurosawa Akira adapted in the film "Rashomon". While I'm not completely certain, the character of Furuyuki Junnosuke may also be an amalgam based on real life manga-ka (comic artist/writers) Matsumoto Leiji and Ishinomori Shoutaro. As others have mentioned, some of the performances border on the frantic and melodramatic, particularly Yoshioka Hidetaka (Tora-San series, Ame Agaru) as Chagawa and Tsutsumi Shinichi (Lorelei, Kyogokudo, Drive) as Suzuki, though not to the point of absurdity, just slightly forced. Yakushimaru Hiroko's role as typical Japanese mother Suzuki Tomoe follows a long string of motherly roles she's played of late (Ichi Liter No Namida, Bubble E Go!, etc.) and is definitely in stark contrast to her Kadokawa idol days in movies such as Sailor Fuku To Kikanjyu and Tantei Monogatari. Model-actress Koyuki (Alive, Last Samurai, Kairo) is steadily becoming one of my favorite actresses as she always plays interesting characters. As the former dancer turned bar hostess Ishizaki Hiromi, she brings likable charm to the role. Her scenes with Yoshioka are heartfelt and you can't help but be touched by their offbeat but tender romance (similar to Densha Otoko in some ways). Miura Tomokazu (husband to 70s icon Yamaguchi Momoe, Tenshi O Yuwaku, Furimukeba Ai) is absolutely unrecognizable as doctor Takuma Shiro but brings a reserved and tempered performance to his role that helps to balance out some of the more exaggerated ones. I'm not too keen on child actor performances in general but Koshimizu Kazuki's performance as Suzuki Ippei and particularly Suga Kenta's ("Godzilla: Final Wars") portrayal of Furuyuki Junnosuke were absolutely great. While Horikita Maki ("Hinokio", "Shinku", "Trick: The Movie 2") as Mutsuko is the main character of the film, surprisingly she has very little to do in the movie aside from be a witness to all the mayhem and melodrama that occurs in the small neighborhood. Special mention should be given to VFX Supervisor/Director Shibuya Kiyoko for the incredible CGI/miniature work that brings to life the world of 1958 Tokyo. From the architecture to the vehicles to the fashion, I was reminded of Peter Jackson's similar eye for detail in his remake of King Kong set in the 1930s. It's absolutely beautiful work and I kept asking myself how they were able to do it (they eventually released a separate DVD showing the production). Some of the humor and cultural references may be lost in translation by some, such as the mistakes regarding Mutsuko's name (Rokku-chan/Number 6) or the hype over wrestler Rikidozan or the nostalgia of riding the C62 train (before the Shinkansen took over). I kind of laughed at some of the cultural references and jokes that came up concerning House Curry, Coca-Cola, and the "Taiyozoku" (Sun Tribe). While some have called the movie a bit overly sentimental in its longings and nostalgia, I think that is what majes the movie good. Like the classic Tora-San movies, Always recalls a time when life in Japan wasn't so hectic, frantic and chaotic. It was a time where everyone in the various communities did really know each other and helped one another as good neighbors should. Even though I'm a child of the 1980s, I still appreciate this look to the past and don't see it as an overly romantic point of view.